PokerLoco is one of the sites in the Ongame network and their idea is to offer the biggest bonuses of all the pokerrooms. This is of course something that we can take advantage of, if you are a decent player you can make lots and lots of bonus money by playing on PokerLoco. They offer both a good First deposit bonus and a freeload bonus. You can choose the bonus that suits you best from the beginner bonus up to the big one with 1000% up to $1000. 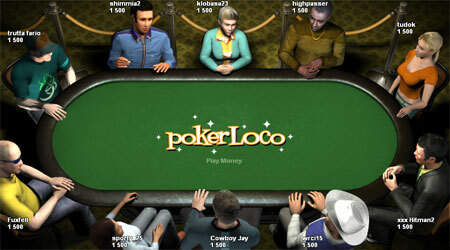 In addition to their regular client PokerLoco also offers live games in their webclient. This means you can play Poker directly in your browser no matter where you are. Even if you are sitting in an internet café or at someones desktop you can play your favourite game, no downloads needed.